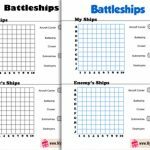 Today I have made this Free Printable Battleships Game for Kids but adults can also play this game. 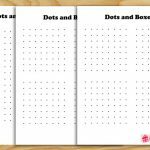 This is a fun strategy games and you can play it at your home and also print these to keep the kids busy on long road trips. This is a classic game and I remember that my brother taught it to me when we were kids. We used to draw the grids using hands or a ruler and we really enjoyed this game as we didn’t have many video games back then. 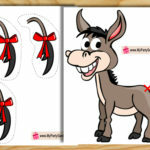 This is a fun way to keep your kids off the screens too. 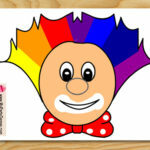 I have made the printables in color and also in black and white. You can easily print this game using a printer at your home. This game can be played among two kids. 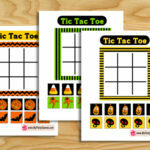 Print two sheets of this game and give one to each kid along with a pen or pencil. 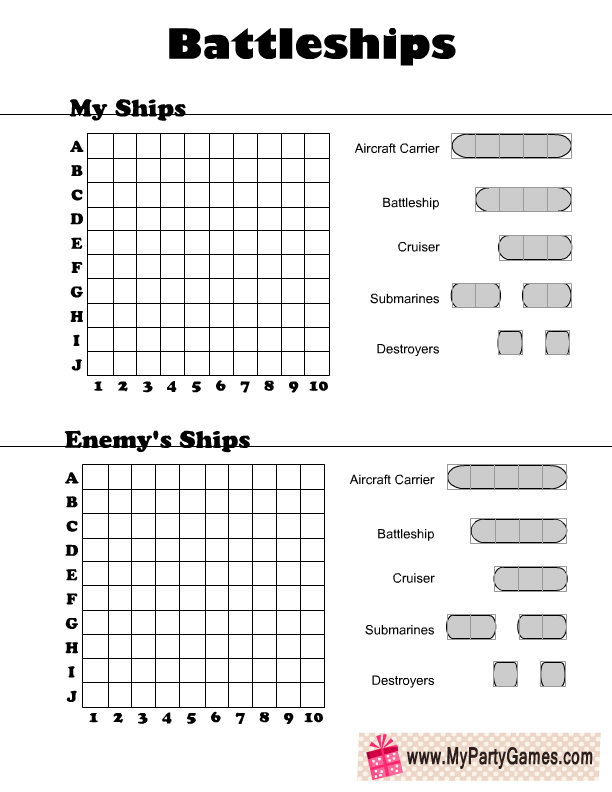 The players should place all of the ships on their grid by drawing an outline of each onto the grid according to its size (ex: size 3 = 3 blocks). Ships may not overlap. The players shouldn’t see the ships of another player. 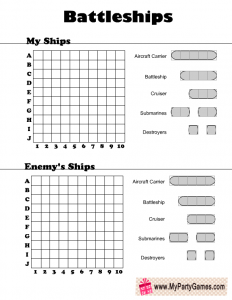 Kids should take turns firing upon their enemy by calling out the location on the grid, like B-4, J-3 etc. and mark hit with a cross “X” and miss with a dot “. ” on the enemy’s ship grid. When the enemy fires upon another player that player should say “hit” or “miss”, the player should also then mark his or her ships with an X when they are hit. 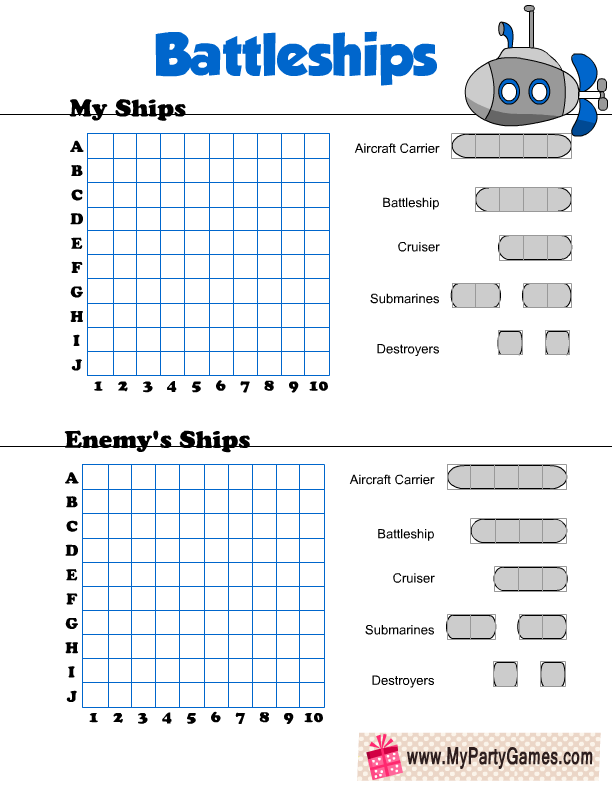 When a player’s ship is sunk, that player must say, “You sank my ____!” (with the name of his or her ship type). 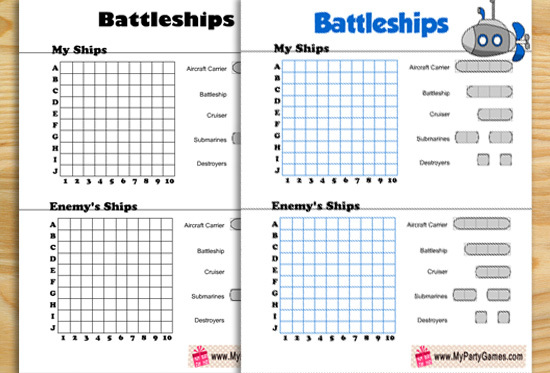 The first person to sink all of their enemy’s ships wins! 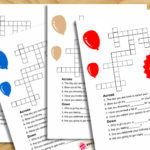 This is the first free printable sheet that I have created for this fun road trip game for kids. Just click on the thumbnail image of this game and then right click and save the bigger image. I have made this printable in black and white so it is really cost effective to print it. I hope that you and your kids will like this game. 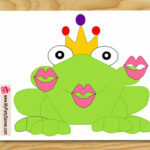 This is another cute free printable that I have made for you. 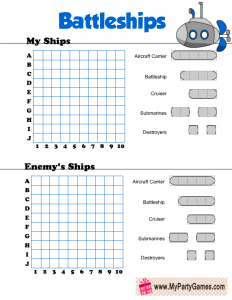 This colorful game printable has a cartoon submarine and grids in blue color. You can print this game by clicking on the thumbnail and saving the bigger image.